PICK-A-PASTA > DINE-IN DEAL @ BUCK'S PIZZA! SALAD, PASTA ENTRÉE AND DESSERT FOR $10.99! The Clearfield County Area Agency on Aging, Inc. will be hosting an 8-week program entitled A Matter of Balance. The program is approved by the AoA, Administration on Aging, and NCOA, National Council on the Aging. Classes will be held at the Clearfield Center for Active Living, 116 S Second St in Clearfield, beginning on April 1, from 1:30 PM to 3:30 PM. The classes run every Monday and Thursday for 8 weeks. MARCH DINNER SPECIAL FOR TWO @ BUCK'S PIZZA! Expires this month! No limits! Dine-In Only. 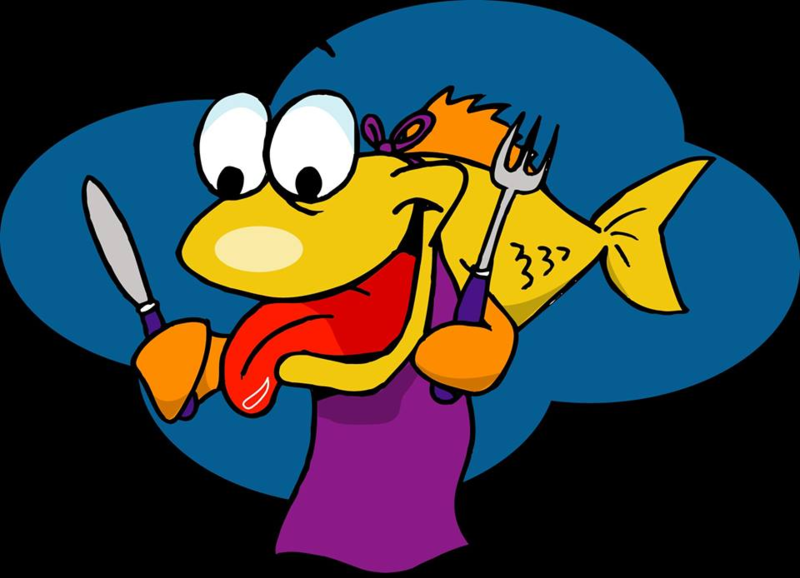 Lenten Fish Dinners are BACK!!!! 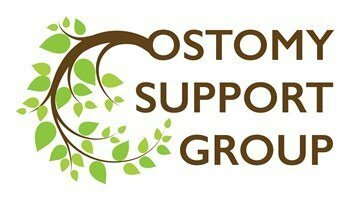 DuBOIS - The Ostomy Support Group of Penn Highlands Healthcare will meet from noon to 12 p.m. on Tuesday, April 2, in Room 107 of the Central Resource Center building, 204 Hospital Ave., at Penn Highlands DuBois West. At this meeting, Coloplast company representative will be the guest speaker. She will be showing new products and ostomy supplies. The support group is hosted by Penn Highlands Healthcare and provides emotional support and useful information for individuals living with an ostomy. It is a unique support group not only in the Penn Highlands Healthcare system but in the country. There are less than 400 nationwide. The Ostomy Support Group meetings are informal, round-table discussions on topics of interest, new product demonstrations and question-and-answer sessions. There is no fee to attend. For more information, please call Heather Kisamore, BSN, RN, CWOCN, at (814) 375-3056. The Clearfield County Area Agency on Aging, Inc. will be offering Diabetic Self -Management (DSM) classes at the Clearfield Center for Active Living, 116 South Second Street in Clearfield. The DSM class is an evidence-based program given two and a half hours, once a week, for six weeks. > Appropriate use of medication and working with your health care providers. Participants will make weekly action plans, share experiences and help solve problems encountered in living with Diabetics. Classes are free and will be held on Wednesdays, April 3 through May 8. This is a six session series. Please plan to attend every session to get the full benefit of the course. Act now - class size is limited. For information or to register, please call the Clearfield Center for Active Living at 814-765-9319. Nobody wants to have a chronic long-term illness or chronic pain. Unfortunately, most of us will experience two or more of these conditions during our lives. The following class, given by the CCAAA, will help people with chronic illness explore healthy ways to live with physical or mental conditions. A healthy way to live with a chronic illness is to work to overcoming the physical, mental, and emotional problems caused by the condition. The challenge is to learn how to function at your best, regardless of the difficulties life presents. The goal is to achieve the things you want to do and get pleasure from life. The class is all about learning common life skills that are needed to become a great manager of both your chronic condition and all other aspects of your life. The Clearfield County Area Agency on Aging, Inc. will be offering Chronic Disease Self -Management (CDSM) classes at the Houtzdale Family Service Center, 40 Terrace Drive, Apt 3 in Houtzdale. The CDSM class is an evidence-based program, given two and a half hours, once a week, for six weeks. Classes are free and will be held on Fridays, beginning May 24, 2019, from 9:30 AM until noon. This is a six-session series. Please plan to attend every session to get the full benefit of the course. Act now - class size is limited. For information or to register, please call the Houtzdale Family Service Center, 814-378-5120. Penn State DuBois will offer the program, "So You Want to Start a Business". Open to all members of the public, as well as faculty, staff, and students, the event is planned for Noon until 1:30 p.m. on Wednesday, April 3, in the Hiller Student Union at Penn State DuBois. The program will feature an introduction to the North Central PA Launchbox by Launchbox Director Bradley Lashinsky. The Launchbox initiative aims to help local companies innovate new technologies and processes, expand their business opportunities, and create growth and increased job opportunities in the area workforce. The initiative is also intended to assist entrepreneurs who want to start a new small business of their own by helping to find resources to get started and to begin growing a small business. Following the Launchbox program, a panel of local entrepreneurs and resource partners will have an open discussion about what it takes to succeed in operating a business. Panel members include Ree Mitra, co-owner, Aegis Coffee Roasters, DuBois; Ed Tate, owner, Luigi's Ristorante, DuBois; Herb Bullers Jr., Jefferson County Commission, and owner of Servpro, Brookville Lumber, and Pinecraft Homes; Lindsay Fairman, Technical Leader and Investor, Align Advisors LLC; Jim Chorney, director of the North Central Regional Planning and Development Commission; Aleshia Marshall, business consultant, Clarion Small Business Development Center; and John Siggins, Business Consultant, Ben Franklin Technology Partners. Penn State Startup Week brings some of the leading minds in entrepreneurship and innovation to Penn State campuses across the Commonwealth. It was founded in 2012 by the College of Information Sciences and Technology as "IST Startup Week." The event was created to celebrate a $400,000 gift from David Rusenko ('07 IST) that advanced IST's commitment to supporting student entrepreneurs. The growth of the event to Penn State Startup Week in 2017 built on this effort to engage nearly every corner of the University. The public is always welcome to attend the program and to share a light meal which is provided by the BUDS Gardeners. April 4th: The meeting location is at the First United Presbyterian Church, 43 W. Scribner Avenue in DuBois. Please use the red door at ground level facing Scribner Avenue. For Handicapped Access at the High Street side of the church call 590-9010 when you park. 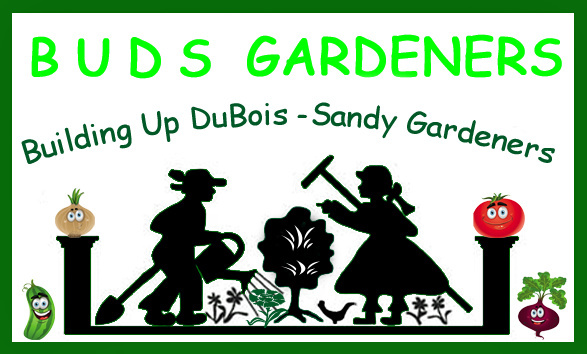 BUDS Gardeners programs are educational and always public. The basement church door will be open after 5:30 PM. Please plan to arrive by 5:45. The evening starts promptly at 6 PM with the meal, then the program begins when the speaker is finished with their meal and everyone sits down. When the program is finished guests may stay for the business meeting or leave as they choose. Please note that should a meeting be postponed, it will be rescheduled for the second Thursday of the month at 6 pm and may be held at a different location. For further information, please contact Cheryl at 371-3322, 590-9010 or cshenkle@verizon.net. On Saturday, April 6, the Clearfield County 4-H Teen Council and Clearfield County Fair Queens for a Cause will be co-hosting the 9th Annual Indoor Easter Egg-Stravaganza in the Expo 2 Building of the Clearfield County Fairgrounds from 11:00 a.m. to 3:00 p.m. 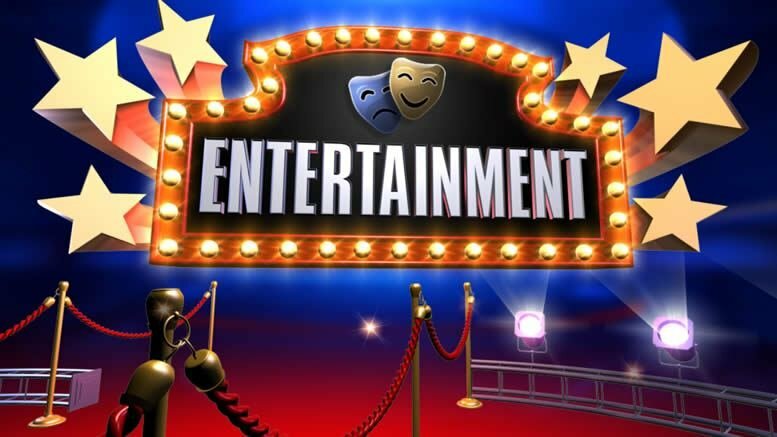 The event will be hosted by Clearfield County 4-H Teen Council and Clearfield County Fair Queens for a Cause and will feature variety of kid-friendly games, a dime toss for kids & adults, kid-friendly vendors, a food booth, pictures with the Easter Bunny & Fair Queen, and of course an Easter Egg Hunt for children 12 & under. Egg hunt will start at 1:00 p.m. and will have 3 divisions running every 15-20 minutes. Easter Egg participants MUST be registered by 12:30 p.m.
All proceeds will benefit the Clearfield County 4-H Program and Children’s Miracle Network (CMN), which is the Fair Queen's cause. For questions or more information, please contact Clearfield County 4-H Teen Council Advisor, Jana Davidson, at 814-592-2465. The event will be held rain or shine. Saturday, April 6, at Luigi&#39;s Villa, 800 West Weber Avenue. dessert. Live and silent auctions, raffles, and other games of chance will also be held. and auction items to the event. This event is sponsored by Johnson Motors and Johnson Subaru. is sponsoring a craft show. 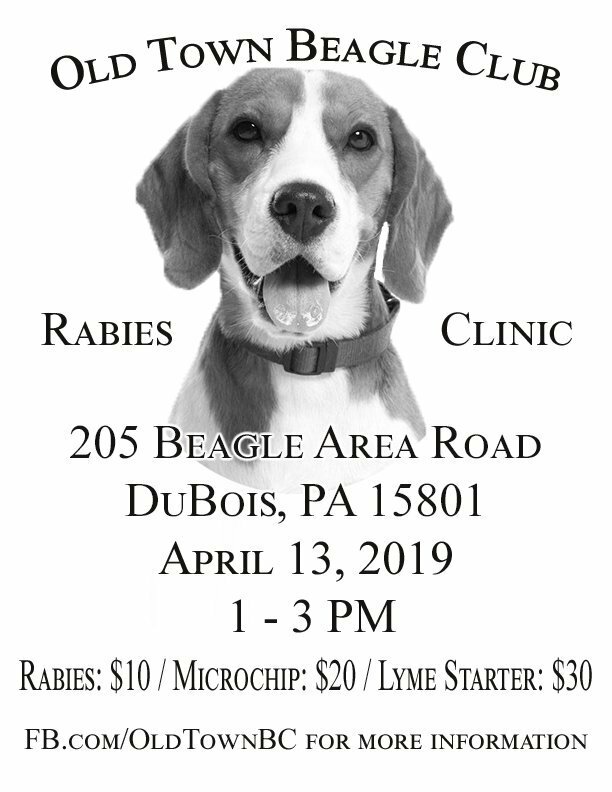 The Old Town Beagle Club is hosting our bi-annual rabies clinic with Dr. Marie Eckle from Allegheny Spay and Neuter Clinic in Woodland again. This time, we're going to try and offer more for everyone. Along with the rabies vaccination, we're also going to have Lyme and microchipping available at what we feel are the most reasonable prices we can pass along. We will run in conjunction with the first day of our Penn Mountain License Trial if you're a brace beagler, so don't forget to share this event and send an invite to all of your friends! Microchipping: $20 (You'll leave with paperwork that will let you register your chip online, and also use it for a lifetime license (for dog) which will of course require payment to I believe it's the county treasurer). Consult with them for cost. Lyme vaccine: $30 (You'll need a booster in 4 - 6 weeks. We'll have Dr. Eckle back during that time frame for an hour or two so that you won't have to hope for an opening with another vet). That booster will also be $30 (it's the same vaccine) and will be good for one year. If you have a question that requires immediate assistance, please get in touch with Paxton Stewart either through messaging this page, or by calling the number listed below. If you have a question that requires reaching out to our vet, I will collect those and reach out weekly so I don't overwhelm her while she has other things going on. Thank you. There is a chance that this new format will make things a bit more slow than normal. We'll reach out afterward to see if you think it's been worth the change and adjust from there in the future. Please bear with us while we try and better suit the needs of our community. The Sykesville Charge of the United Methodist Church presents the Lakeshore Singers performing the Easter Cantata, "Upon This Rock" by Pepper Choplin on Sunday, April 14th at 10 am at Grace United Methodist Church in Sykesville. You are also invited to the week long Holy Week festivities. Call Grace UMC at 894-2784 to find out more! DuBOIS – A free blood pressure screening will be held from 2:45-4:15 p.m. on Monday, April 15, in the DuBois Community Medical Building. Hosted by the nurses of Penn Highlands DuBois, the screening will take place in conjunction with the Penn Highlands Community Pharmacy on the third Monday of each month. When left untreated, the damage that high blood pressure does to your circulatory system is a significant contributing factor to heart attack, stroke and other health threats. But the good news is that it sometimes can be controlled with lifestyle changes – good diet, exercise and not using tobacco. The DuBois Area Historical Society is sponsoring another genealogy program by Barb Kopshina, noted genealogist from the area. This workshop is scheduled for Thursday, April 18, 2019, at 2:00-3:30 p.m. at the DuBois Area Historical Society, 30 West Long Avenue, DuBois. Kopshina, who attended a week-long seminar from the Genealogical Research Institute of Pittsburgh (GRIP) last summer, will present new findings about church records, local land records, probate documents, immigration passenger lists, newspapers, and maps. This information will be of special value to family historians looking for new genealogical clues in their research. The Sykesville Charge of the United Methodist Church invites you to join them for their Easter Sunday celebration! It starts with Sunrise Service, featuring The Stones of the Passion at Pleasant Valley United Methodist Church at 7AM, followed by a Breakfast Tureen at 8:30 AM at Grace United Methodist Church. A traditional Easter Service will be held at Grace UMC at 10AM. The Friends of the Library will be holding their annual reception on April 22nd from 6:00 P.M. until 7:30 PM. in the meeting room of the DuBois Public Library. The Sandy Lick Mountain Dulcimers will provide entertainment. Clearfield County Planning & Community Development Office will hold a public meeting on Monday April 22, 2019 at 6:00p.m., at the Brady Township Community Center. This is an informational meeting for the Brady Township Lateral Assistance Program, funded with the Community Development Block Grant monies. Interested residents, becoming customers of the Brady Township Sewer System should attend. Lisa Kovalick, Community Development Specials, will give a presentation of the application process for assistance. The Lateral Program is designed to assists customers with connecting to the main sewer line in Brady Township. If you own your home, meet the income guidelines and your property taxes are up to date, you may qualify. Applications will be available at the meeting. For more information, contact Lisa Kovalick at 814-765-5149. Jefferson County Relay for Life has bingo every Monday at the Heritage House in Brookville. Doors open at 5:30. Early Birds 6:30, regular bingo 6:45. Pack of 6 cards $15.00, 12 cards $20.00, 18 cards $25.00. Packs include 10 regular games, 2 specials, and coverall. Coverall Jackpot starts at $300.00! Consolation prize $150.00. Quickie games and rip tickets also available for sale. Door prize. Losing rip ticket holders go into drawing for prizes. Non-smoking. Free coffee. Snack bar available. For more information, please text 648-0825. All proceeds benefit Relay for Life and the American Cancer Society. We need Crafts for our Annual Fundraiser! Crafters should drop off their creations by May 31st at the DPL during regular hours. Drawings will be held at 9:00 A.M. on July 1st. Children's Department Open Until 8PM on Mondays only. 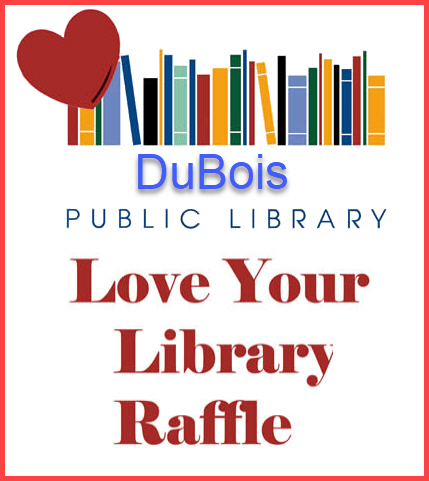 The proceeds of the sale will benefit the DuBois Public Library. The Clearfield County Area Agency on Aging, Inc. will be offering a PDA Evidenced-Based Program, Healthy Steps in Older Adults (HSOA), for Clearfield County residents aged 50 and older. The class will be held at the Karthaus Center for Active Living, Shepherd of the Hills Lutheran Church, 3637 Main St. in Karthaus. HSOA is an evidence-based, falls prevention program, designed to raise fall prevention knowledge and awareness, introduce steps to reduce falls and improve health and well-being, and provide referrals and resources. The program consists of two 2-hour workshops. Classes are free and will be held on Wednesdays, April 24 and May 1 from 10:30 AM until 1:30 PM. Please plan to attend both sessions to get the full benefit of the course. Act now - class size is limited. For information or to register, please call the Karthaus Center for Active Living: 814-762-9644. DuBOIS - An Earth Day celebration at Penn State DuBois will feature educational exhibits and programs on topics such as sustainability, clean water and air, and more. The public is invited to attend, free of charge, from 11:30 a.m. until 1:30 p.m. on Wednesday, April 24, in the Multipurpose Building Gymnasium. 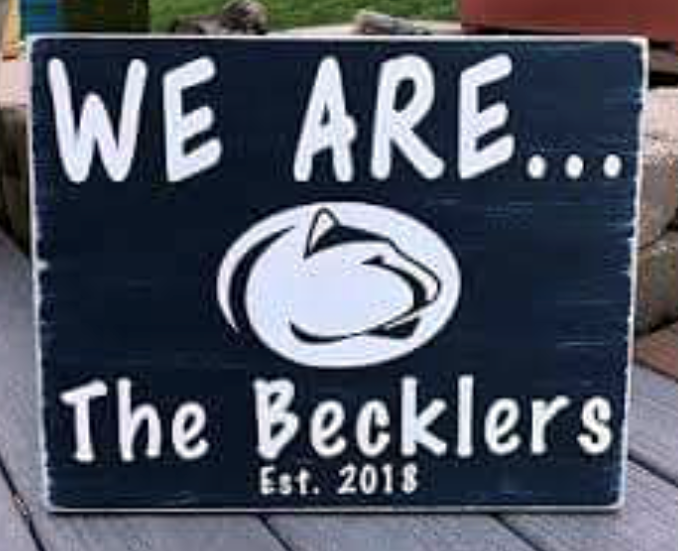 The event is sponsored by the Penn State DuBois Collegiate Chapter of the National Wild Turkey Federation, the Wildlife Society, and the Green Team. Also, to be highlighted are assistive technology devices made to help people with disabilities perform tasks at home and at work. The devices were designed and constructed in a collaboration between students in the Penn State DuBois Occupational Therapy Assistant and Engineering programs. Other exhibitors include Advanced Disposal, the Anderson Creek Watershed Association, Bilger's Rocks, Clearfield County Conservation District, Clearfield County Solid Waste Authority, Domtar, Down to Earth Garden Club, Goodwill Industries, Headwaters Resource Conservation & Development Council, Highland Park Honey, Jefferson County Conservation District, Jefferson County Extension Office, Jefferson County Solid Waste Authority, Master Gardener Cheryl Shenkle, O-I, Penn State Cooperative Extension, and the Pennsylvania Alliance for Clean Water and Air. The Kylertown Center for Active Living, in partnership with the American Association of Retired Persons (AARP), is offering area individuals aged 55 and older the opportunity to take the AARP Driver Safety Course/AARP Driver Refresher Course. The classroom courses were developed by AARP to help drivers remain safe on today's roads while providing the bonus of a three-year discount on the course graduates' car insurance. All automobile insurance companies conducting businesses in Pennsylvania are required to provide a premium discount to graduates of the Driver Safety Program who are 55 years of age and older. Couples, who both have a driver's license, are each required to be certified in the program in order to be eligible for the discount. Although geared to drivers 55 and over, the class is open to all ages and AARP membership is not a requirement. 1. Thursday and Friday, April 25 & 26, 2019, from 1:00 PM until 5:00 PM. 2. The Refresher Course is offered at the Kylertown Center for Active Living, 70 Senior Drive, Kylertown, on Monday, April 29. The class runs from 1:00 PM until 5:00 PM. The Refresher Course is open to individuals who have previously taken the original eight-hour course and/or the refresher course within the past three years. The classes are open to all drivers over 55, with the cost for non-AARP members at $20, while AARP members pay a discounted price of $15. Checks are to be made payable to AARP and must be given to the instructor on the first day of class. Class size is limited and the required registration is taken on a first-come, first-serve basis, so early sign-up is suggested. You may register by contacting the Kylertown Center for Active Living at 814-345-6338. Information on this and other programs, meals, and activities is available by calling the Kylertown Center at 814-345-6338 or by visiting the CCAAA website at www.ccaaa.net. The Clearfield County Republican Committee will hold the 2019 Lincoln Dinner on Thursday, April 25, 2019 at Moena Restaurant, 215 East Market Street, Clearfield. The program will feature PA Commonwealth Court Judge Kevin Brobson as keynote speaker. Judge Brobson is running on the 2019 ballot for retention. Judge Brobson was elected to the Pennsylvania Commonwealth Court in November 2009 and was commissioned and took the oath of office on January 4, 2010. In August 2015, the Supreme Court of Pennsylvania appointed him to serve a four-year term on the Judicial Conduct Board of Pennsylvania. He currently serves as the Chairperson of the Board. Candidates seeking election to Pennsylvania Superior Court, and Clearfield County commissioner, District Attorney, Register and Recorder, Treasurer and Coroner as well as local offices have been invited. Elected officials will also be present. Trump for President 2020 items will be available for purchase. Social time will begin at 6:30 pm followed by dinner at 7:00 pm. 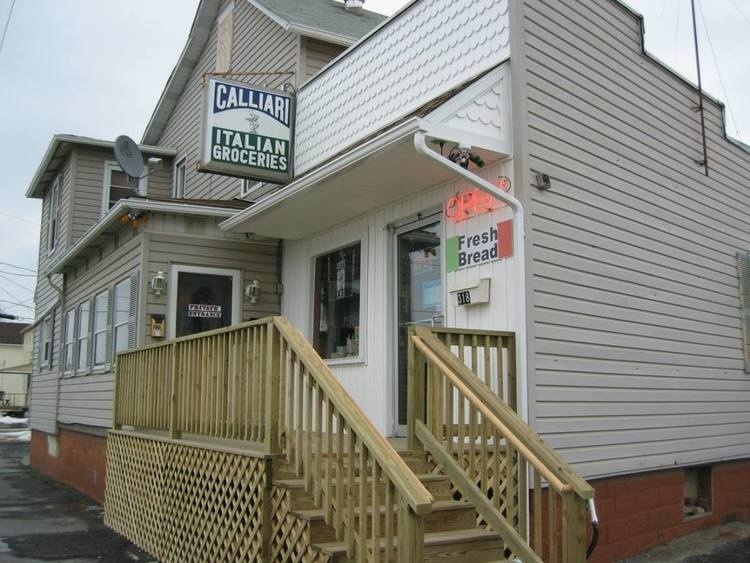 The meal will consist of appetizers followed by baked ham, beef tips/gravy with noodles, au gratin potatoes, broccoli, cauliflower and carrots, salad, rolls, coffee, water and iced tea. Dessert will be cake. Reservations are available by contacting 765-5391 or 592-9303. Additional information can also be found on the committee's facebook page Clearfield County GOP. The Clearfield Arts Studio Theatre, Inc. (CAST) is bringing Neil Simon's funniest play, RUMORS, to their stage. 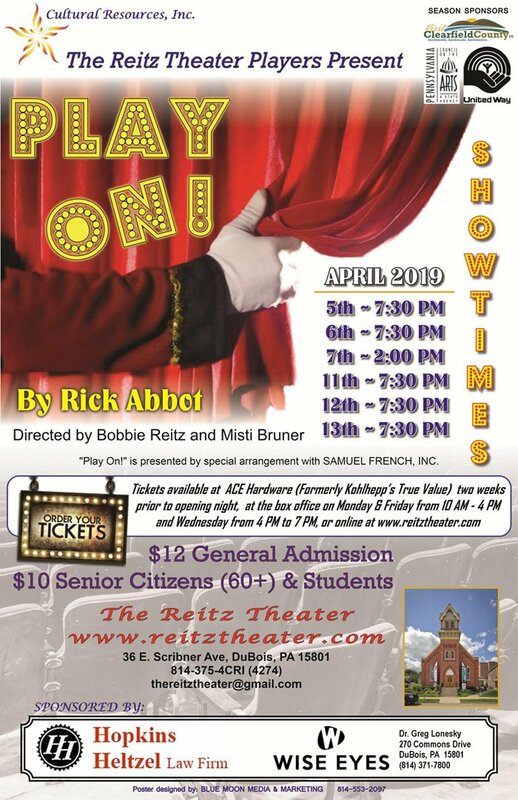 Performance dates are April 25-27 and May 2-4 at 7:30. Robert Roxby serves as CAST's graphic designer, and Rick Evans is CAST's production photographer. Tickets are available online at ClearfieldArts.org, at the CAST office on Mondays from 5:30-6:30, and at the box office 30 minutes before each show. Includes food, snacks, beer, pop & water. Cash Bar available. 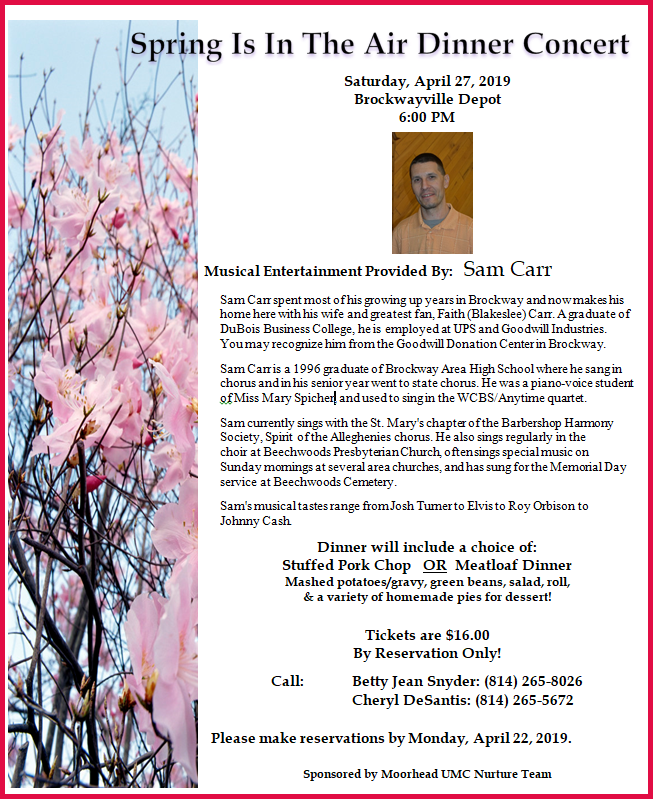 Call 765-2696 for tickets or visit the list on the flyer below.